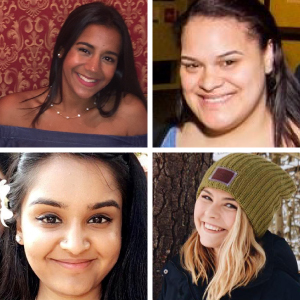 Four members of the Stonehill Class of 2018 were recently awarded the prestigious Benjamin A. Gilman Scholarship for international study during the spring 2017 semester. Miranda Arena, an accounting and economics minor from Stoneham, Massachusetts, will be studying diplomacy and international business at Dubrovnik International University in Dubrovnik, Croatia. Miranda is a member of the Women's Rugby team, president of the Accounting Association and candidate for Beta Alpha Psi, the accounting honor society. She currently works on campus in the Student Accounts Office, Business Administration Office and the Sports Complex. After graduation she plans to work at PricewaterhouseCoopers, an international public accounting firm, as an auditor. Miranda caught the travel bug after travelling to Cuba for her learning community during spring 2016. She is looking forward to acquiring international business and communication skills abroad to be applied to her future in cross-cultural business. Mohini Patel, a biology major and an environmental studies minor, is from Randolph, MA. During the spring 2017 semester she will be studying tropical ecology, marine ecosystems, and biodiversity conservation in Panama City, Panama and Costa Rica. She will also be conducting an independent research study at the La Amistad Biosphere Reserve in Panama. She hopes to share her experiences and knowledge with other first generation college students who would like to study abroad at Stonehill. Yaritza Sanchez is an international business major with a double minor in entrepreneurship and Latin American studies from Dorchester, Massachusetts. During the spring 2017 semester, she will be studying abroad in Valparaiso, Chile through the Spanish Language and Latin American Studies program at Pontificia Universidad Católica de Valparaiso. She hopes to improve her Spanish speaking skills by doing an internship in Chile and immersing herself in the Chilean culture. She wants to be able to see the concepts that she has learned from her classes in practice. Yaritza plans to share her study abroad journey through blogging and has focused her Gilman follow up project on inspiring inner city students to follow their dreams and take advantage of opportunities like the Gilman scholarship program. Adeline Tavarez is a political science major. She is 100% Dominican and is a native Spanish speaker. During the spring 2017 semester, she will be studying in Cape Town, South Africa through the School for International Training (SIT). The Multiculturalism and Human Rights program is a perfect fit for her, as she wishes to pursue a career working with human rights issues. On campus, Adeline is a volunteer coordinator for My Brother’s Keeper (MBK) through Into the Streets, a member of the Student Alumni Association (SAA), a Relay for Life participant, and the Vice President of the Luminaria ceremony. Last winter she participated in the H.O.P.E service immersion trip in New Orleans, where she learned a lot about hunger and homelessness. She hopes to continue to learn about human rights internationally while in South Africa, and plans to pursue an internship in human rights in Washington, D.C. when she returns from abroad. The Gilman Scholarship is a congressionally funded award sponsored by the U.S. Department of State and administered by the Institute for International Education (IIE). The mission of the Gilman program is to “diversify the kinds of students who study abroad and the countries and regions where they go.” Each year, more than 2,300 awards of up to $5,000 are given out to full-time, Pell Grant-eligible students nationwide. If you are interested in learning more about the Gilman Scholarship, please visit the Office of International Programs (Duffy 131) or www.iie.org/Gilman.